Besides information about myself and my premier hobby, HAM Radio, in general, you can find here many hambrew links. During my queest for nice projects, I found so many nice ones, which I want to join with other HAMs. I wish everyone lots of fun at my site! My name is Maarten Ouwehand, I am 53 years young and radio amateur, wich you could guess already, hi. I am a member of the VERON Centrum. An other big hobby of mine is scouting. My favorite piece ofequipment is ofcourse my Kenwood TS-940S. 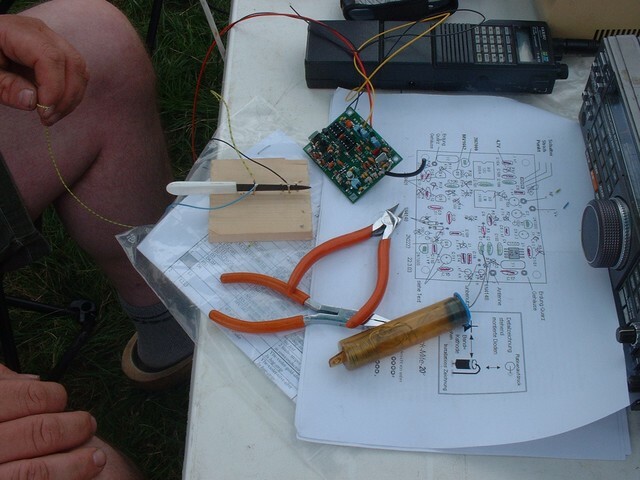 Since also C-licenced amateurs are allowed to use HF ite is used many times. At the moment it is been repaired, so I have to use my XYLs Yeasu FT101ZD. One of my latest projects is the RockMite, a 20 meter QRP CW transceiver. The Trx shown at the picture was just finnished during the 2005 fieldday but rejected to function properly. After some test it seemed that one of the resistors was incorrect. Because of the little time I have it is still at my workbench. At the picture you also can see the keyer I have made of a nailpolisher.